Everyone loves popcorn! The smell alone of popcorn being made creates smiles. 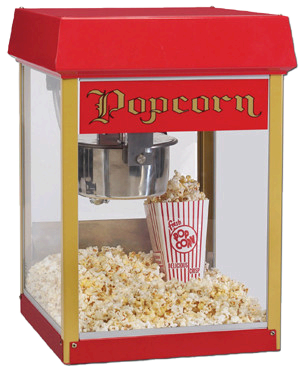 you can create that same effect at your event with our popcorn machine! This commercial grade popper makes popcorn fast and delicious. Includes popcorn packs and popcorn bags, enough for 25 servings. Additional popcorn packs and bags can be purchased under the accesories and add ons category.